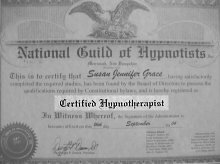 A former college instructor, Susan Jennifer Grace has been in private hypnosis practice for over 11 years. She is the Director and instructor of Gracehypnosis Training Center, Master Hypnotist, Master Practitioner of Neuro-Linguistic Programming and Autogenics Practitioner/Trainer. Susan continues to develop her skills in all areas of her profession, so that she can pass on the benefits of the most up-to-date techniques to her clients. She has taken many hours of counseling training through various volunteer organizations such as crisis centers and women's intervention centers. 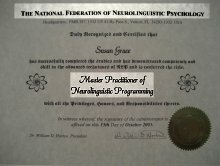 An accomplished speaker and Faculty Member of the NGH, she presented a seminar on Autogenic Relaxation Training at the August 2010 National Guild of Hypnotists annual convention in Massachusetts. 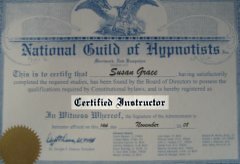 Susan is a people-oriented former college instructor who recognizes the importance of developing a sense of trust and rapport between client and hypnotist. Her skillful approach, her professionalism, her clear sense of ethics, her instinctive abilities to assist people in reaching their goals, and her passion for hypnosis are just a few of the reasons why Susan excels in the profession of helping people. It is Susan's firm belief that each and every professional who is in the business of helping others to manage issues such as smoking, weight gain or stress, need to "walk the walk and talk the talk". Susan does! After all, if our hypnosis skills and techniques cannot help ourselves, how can we expect them to help others.